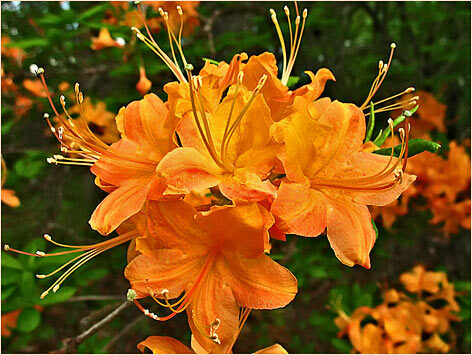 Flame Azalea is a Rhododendron species, a group sometimes referred to as “honeysuckle” because of the long “exerted” stamens like the familiar Japanese Honeysuckle. They are brilliant now along the Blue Ridge Parkway in Floyd County, gone by in many lower elevation locations, just coming into full bloom higher up. They range in color from the palest yellow to deep, dark orange and reds. Oh, I miss those! I haven’t seen them here (yet). Thanks for the reminder of home. We saw lots of these orange-colored flowering shrubs at Biltmore Estates earlier this month, but I didn’t know what they were. We thought they looked like azaleas but weren’t sure since we’d never seen ORANGE azaleas! Thanks for the info. Thanks for this stunning photo of these glorious native beauties! Previous Previous post: Morgellons: A Mystery More Than Skin Deep?